For years, a game of environmental legislative tug of war has left both sides of the debate with a detrimental urge to see the other face down in the mud. Executive land grabs from one side are lashed back at with public land privatization from the other. But with a closer look, the issue runs deeper than a partisan game. There seems to be an invisible hand tugging from Big Oil, keeping a dying industry on the playing field at an unfair advantage. 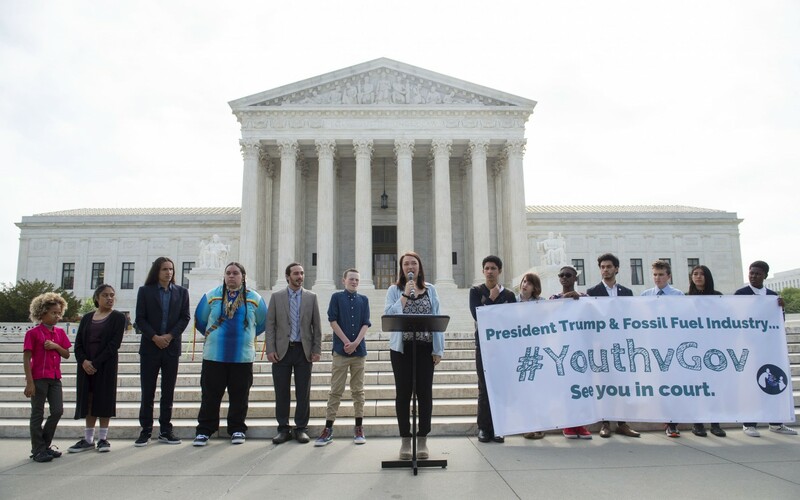 Our Children’s Trust, with a group of 21 young plaintiffs from all four corners of the country and everywhere in between, have called in the judicial branch as a referee. They hope to put a halt to irresolute treaties and talks; they’re calling for a concrete, national science-based climate recovery plan. Spearheaded by human rights attorney Julia Olsen, Lebel and the other young plaintiffs have filed the case Juliana v. U.S., on the grounds that continuous administrations have ignored their own commissioned experts on the dangers that climate change poses to our Nation. The Trust, a nonprofit organization, aims to elevate "the voice of youth to secure the legal right to a stable climate and healthy atmosphere for the benefit of all present and future generations." The case was filed in 2015 against the Obama Administration and Federal Government. The Obama Administration responded with a motion to dismiss. Meanwhile, Big Oil interest groups intervened on behalf of the defendants, and have subsequently withdrawn. The motion to dismiss was denied, and accompanied by a withdrawal from the case by Big Oil. A court date was set for February 2018. But the change in administration brought forth a petition for writ of mandamus — a final attempt to dismiss the case — and the proceedings were once again put on hold. However, on March 7, the petition for writ of mandamus was denied by the Ninth Circuit Court without prejudice, and the case will move forward on Oct. 29. The case itself is relatively new, but its history extends back centuries. According to the case, the United States has emitted 25.5% of the world’s cumulative carbon dioxide emissions from within its borders between 1751 and 2014. Scientists have known since the late 19th century that the increase of carbon dioxide in the atmosphere would elevate the Earth’s surface temperature. In the mid 1960s, the administrations of both Presidents Lyndon Johnson and Richard Nixon were warned by advisors that increased carbon dioxide levels would adversely affect the livelihood of American citizens. Then, in the late 80’s, the director of NASA testified before congress that effects from carbon pollution in the atmosphere were already being observed. A report from the Environmental Protection Agency (EPA) submitted to congress in the early 1990s concluded that reductions in carbon dioxide emissions were the only way to stabilize the climate. Following the EPA report, The Congressional Office of Technology Assessment (OTA) delivered to Congress a comprehensive conservation, energy-supply, and conservation package that could lower carbon dioxide emissions 35% from 1987 levels, and save the Federal Government $20 billion per year. Almost 30 years and countless non-binding treaties later — including the recent Paris Accord — we are still at a standstill with the implementation of a national carbon dioxide emission reduction plan. Instead, the total U.S. production and consumption of fossil fuels has increased and public lands have been leased excessively for the production of fossil fuels, much of which has been driven by federal subsidy money, according to the lawsuit. “We don’t want the courts themselves to make policy, we’re not asking for a carbon tax per se, or a particular policy, because that’s the job of congress and that’s the job of the president's office and the agencies,” Lebel said. The aim of the case is to create a concrete emissions reduction goal that is legally binding. From there, it is the job of the executive agencies to decide how to reach this goal. Just decisions, however, are not possible without accurate representation. A lot of the decision making power for local energy projects comes down to a non-elected, politically appointed board of five commissioners at the Federal Energy Regulatory Commission in Washington D.C., according to Lebel. Lebel’s frustration with the Federal Energy Regulatory Commission starts in his backyard in Oregon, where the Jordan Cove natural gas pipeline was proposed to run on land a mile off the border of his family farm. Eminent domain allows the government to seize private land for public use in situations that would benefit the public, as long as the landowners are justly compensated. The concept was originally for public utilities that the majority of the public benefitted from without destroying vital resources. The landowners affected by this pipeline would be monetarily compensated, but Lebel and others — Republican and Democrat alike — agree that the land has intrinsic value worth more than a payoff. If the majority of the community benefits from a project like this, and it doesn’t destroy vital resources or endanger the community to a high degree, there would not be as much opposition as there is today on these pipeline projects like Standing Rock and Jordan Cove, according to Lebel. Seeming indifference from the commissioners prompted Lebel to become more involved in agency meetings and eventually led him to a five day fast in Washington, D.C. to raise awareness of the issue. “Perhaps these should be elected commissioners if they’re holding this much power over our energy system,” Lebel said. The national oil economy is driven by projects such as these; projects where local residents have no representation in the decision making process. “We want the climate science to be recognized and implemented at the highest levels of the government,” Lebel said. Another young person involved in the Jordan Cove fight reached out to Lebel and asked if he would like to join him in a case challenging the U.S. government’s fossil fuel policy with other youths across the country. Our Children’s Trust started from a local, grassroots level; many youths in the case have similar experiences with local energy projects or indirect effects of climate change that have degraded the environment around them. For Lebel, on the West Coast, this involves more intense fire seasons, for plaintiffs in Louisiana and Florida this involves more intense flooding. Regulating carbon dioxide emissions top-down from a federal level could result in more concrete local solutions. Throughout history some of the most progressive change has happened when polarization has brought an issue to its breaking point. Lebel says that Brown v. Board of Education is an inspiration to this case; the public will wasn’t quite there yet for desegregation but the courts stepped in to defend the rights that were being violated. According to the Yale Program on Climate Change Communication, 74% of the U.S. population does support the regulation of carbon dioxide as a pollutant. The climate science has convinced the people, and now the government and private sector need to catch up. “There’s real, tangible, constitutional rights being violated here through our government’s actions and historical actions,” Lebel said. The lawsuit holds the executive agencies and private sector accountable for these constitutional violations while allowing freedom in the implementation of these goals. Climate change extends beyond the realm of fossil fuel emissions: from deforestation and soil degradation to over-consumption and ecosystem collapse. It is a multifaceted problem that garners a multifaceted solution. However, to Lebel the root of the problem stems from something simple.